Two overnight flights to get to spend two days in the Byron Shire. Spring time in New South Wales with my love. 36 hours of healthy natural vibes. Connecting with ourselves, with each other and with our surroundings. Though we tend to find pockets of bliss in most places, it’s always nice to embrace opportunities to soak up some harmonious Oz energy, even if it’s a micro short visit this time. He picks me up at Gold Coast Airport at 8am on Saturday, and we both depart from there at 8pm on Sunday – he for Sydney, I for Singapore. He worked in Brisbane in the days leading up to the weekend and will be working from Sydney and Melbourne all of the following week. As Saturday is gloriously sunny, we spend it roaming around outside – farm, beach, rocky hills, outdoor eating to live music. On Sunday, it pours down for most of the day – perfect for a roadtrip in the hinterland, stopping in a bunch of charming little villages, Newrybar, Bangalow, Federal, Mullumbimby and Brunswick Heads. Every little moment of this journey feels exciting – the late night travelling on my own; being picked up by my love; enjoying every single one of the 1,560 awake minutes we have together, breathing in the fragrant air, warm in direct sun, cool in the rain. Our phones are solely used for their gps and camera functions, and we only check the time as the light turns golden towards the end of Sunday afternoon. As usual, we go for a mix of oldies (see here, here, here and here) and new treasures, and the pace is perfect for both of us – lots of lovely spontaneous impressions, combining rituals and pleasant surprises, yet plenty of time to take it all in and read a bit and stare into each other’s eyes or into space before following our noses to the next treat. Abode. Clean, tidy, airy granny flats full of natural light, wooden elements and coastal vibes, nestled between lush green nature reserves and the crystal clear, roaring Pacific Ocean… perhaps with a travelling banana tree in the yard… are among my favourite things about Airbnb, haha! We’re staying close to where we stayed back in April, around the corner from Suffolk Bakery, just south of central Byron, and after the farm, we go here to change into our bathers and pick up some towels and reading material. Tallow Beach. Following the alluring sound of roaring ocean through the shrub- and heathland off our street, filled with beautiful native flora, such as banksia (Australian honeysuckle) and ti tree, we notice how the soil quickly turns increasingly sandier and the dry, fragrant air saltier – and then we reach the wide white expanse of beach bordered by the rocky hills of, far to the left, Cape Byron and, far to the right, Broken Head. We drop our stuff in the smooth, hard sand, run across it and laugh as we hit the shallow, pristine waves. Splash around for a bit. Swim back and forth. Observe the surfers further out. The temperature is perfect – not too cold, yet definitely refreshing. After a while, we run back up to our bags and settle down on our towels. Sanoop has brought the newest issues of all of my favourite Australian mags – Peppermint, WellBeing, Frankie – as well as a couple of books given to him by one of his business partners, a sweet politician, with a big heart and a big passion for literature, whom he met for dinner with her husband and kids the other night. She wants me to read some of her favourite Australian fiction – Breath and The Dry. Diving eagerly into this pile, we stay on the beach for a good while, under a burning sun, next to each other. Ahh. Lighthouse Walk. 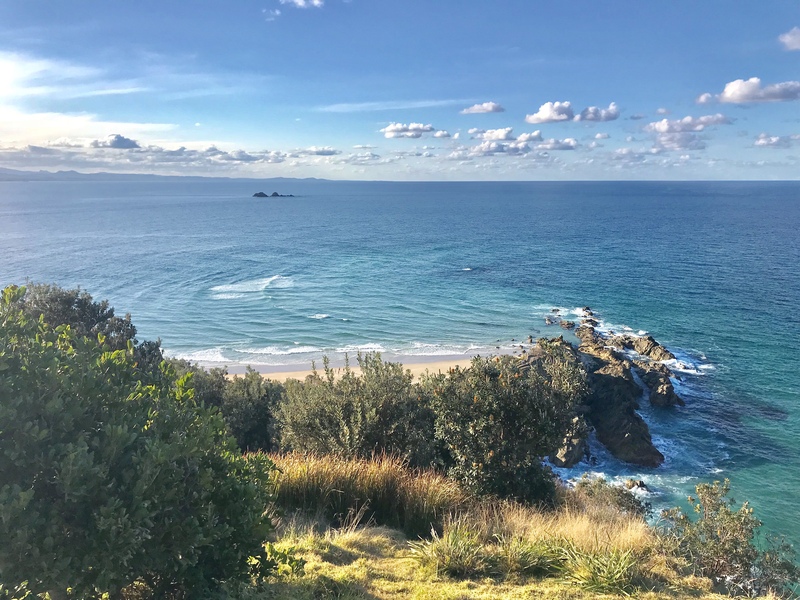 Later, we drive up and park our car by Beach Byron Bay, where we’re dining later, pick up a long black (me) and chai latte (Sanoop) from the kiosk and walk down to Clarkes Beach. Kids, dogs, seabirds and surfers are frolicking in the soft, golden light of the late afternoon as we embark on a steep, gorgeous hike leading from the rocky outlook point at the far end of the beach and around the cape to the swanky beach houses and neat palm trees overlooking Wategos Beach and the rugged easternmost tip of mainland Australia poking out in the sea and, finally, the white and welcoming lighthouse on top of the hill, from where we meander down along the forest road on the southside of the cape to finish the ‘circle’ of the hike, admiring the spectacular bird’s view of Tallow Beach and enjoying the cosiness of walking amongst tall, dark trees under a darkening sky full of gold-tinted baby skies. On the way up, we stop many, many times to admire the sweeping panorama stretching out below us – a colour palette of all shades of green, blue and brown – and share jokes and sudden insights. At one point, a couple standing across the path from us start pointing eagerly towards a certain spot in the water. We run over to see what’s up – and notice a flock of dolphins and a couple of whales jump and dance around just a few waves’ distance north of the cape! Beach Byron Bay. We’ve been here a handful of times over the past year and a half… and I just love it. The cosy ambiance, the coastal decor, the consistently delicious seafood and vegetable dishes… with our fillet of fish of the day, I have a wonderful glass of Bellvale Pinot Noir from Gippsland, Victoria, where we spent a weekend earlier this year. Vegan Cake and Live Music. As per tradition, after dinner, we pick up two pieces of freshly baked and super rich vegan cake from Spar (the baked goods are on display in a glass counter facing the street in front of the supermarket, hehe!) and devour it in Byron’s touristy heart, crammed in between backpacking teenaged hippies from all around the globe on some stoop or bench, while listening to a soulful longhaired musician jamming away on at least four different instruments simultaneously a few metres away from us on the pavement. Sleep. We entertain the thought of getting a drink at the seemingly happening bar St Elmo but after taking the last bite of my beetroot brownie, I suddenly start to feel the effect of a sleepless flight followed by a day of fresh air. I’ve been feeling surprisingly full of energy, agile and well all day, but at this point, the fluffy duvets in our cosy Airbnb seem more attractive than a bar stool and alcohol, and so we head home after nodding goodbye to the singer-songwriter. Morning Bliss. I sleep like a log all night, happily dressed in a sweater, yoga pants and socks – while I have nothing against tropical heat, I also really, deeply love having to bundle up in comfy clothes to stay warm! – and with the heater on, and when we wake up, we keep snoozing for what seems like a long time, listening to the rain drumming on the roof and debating whether to do Yoga with Adriene on the floor in front of our bed or check out one of the local yoga studios. Find What Feels Good wins. Suffolk Bakery. This charming place is happening early in the morning! Surfers, yogis, artists, most of them barefoot. Standing or sitting around on the wooden veranda, waiting for or enjoying their caffeine and/or sourdough fix, the artists among the crowd sketching out ideas on paper pads while sipping hot liquid in chunky ceramics cups. I pick up a coffee while Sanoop disappears in next-door Aldi and comes out with a bag of organic dried mango for me to enjoy on my flight back to Singapore. He knows me pretty well, haha. Newrybar. Driving into the rolling hills and farmlands of the hinterland, we stop at the centre of Newrybar, whose short main street offers up the essentials for any rustic Aussie hamlet: community centre, petrol station, whole foods convenience store, three fashionable ethical and artisanal clothing stores, such as Driftlab, the sweetest (or, only sweet?) department store I’ve ever seen, Newrybar Merchants, carrying the beautiful and beautifully curated artisan works of local/regional and a few, selected overseas industrial designers, artists, florists and writers, and a natural foods emporium, Harvest, consisting of three white wooden buildings, a deli/cafe, a bar/restaurant and a bakery, with wrap-around verandas and a lush garden bursting with vegetables, fruit (there’s a lemon tree!) and herbs. That’s where we have our breakfast – by the fireplace in the lounge area of the bar/restaurant, right by the open kitchen. Very idyllic. Bangalow. The pouring rain cancels the farmers’ market but it doesn’t meddle with the picturesque charm of Bangalow. We were supposed to pick up some aloe vera cream we’d ordered from our favourite skin care line, Wild Nature, at the Sunday market, but as the market isn’t happening, Dylan, the cream maker, drives over from his factory in the Arts & Industry Estate in Byron to hand-deliver the goods at Woods, where we’re drinking homemade almond/cashew milk mixed with turmeric, black pepper and baobab and garnished with cinnamon and rose petals. Very sweet of Dylan; very delightful drink! Woods is set amidst beautiful outlets of local art and textile design – such a lovely, lively place full of friendly smalltalk and very many cute dogs. After thanking Dylan warmly and catching up with him briefly, and after meticulously licking the inside of the glass in which our drink was served, we get up and check out the clothes at Rowie, a label named after its designer, a girl who lives in Bangalow and sells her flowy, minimalist, feminine garments here as well as from a small store in Byron. Sanoop gets me a beautiful, versatile white shirt-dress-thingy. We meander around Bisque Traders and down the quaint main road before heading off. Federal. On our way further into the tunnels of trees, between banks of wildflowers, meadows full of horses and occasional views of the bay peeping out among the green canopies of the hinterland, we stop at a custard apple stall and pick out and weigh a few of the funnily shaped specimens in our hands, struggle with our conscience for a bit after an unfortunate realisation, tossing our Singaporean dollars in our hands and regretting the fact that they aren’t Australian (ironically, our last Australian coins did go towards supporting the local farmers! ), and finally put the delicious, soft-shelled snacks back down in their crate and drive on. We really like custard apples, the knobby structure of the fuzzy skin, the citrussy scent, the ease with which they crack open, the creamy texture, BUT we cannot justify paying in a foreign currency, haha. A few turns down the road from the stall, we stop in Federal and share a box of divinely tasting and beautifully arranged sushi at Doma, a small restaurant run by two cheerful Japanese chefs, who make all of their food, mainly inspired by their native cuisine, fresh in the open kitchen of the tiny yellow cottage – to be enjoyed in the grassy yard, which is dotted with casual seating and chicken roaming around in the garden beds. Large white parasols are protecting guests from the rain. Mullum. ‘The Biggest Little Town in Australia’ is as charming and welcoming as all of its fellow Byron Shire villages, and I would happily stay for days, weeks, for all of the festivals, for long yoga or creative retreats… haha. Today, we stop very briefly to pick up a few treats – charcoal toothpaste, dried local pineapple, dark chocolate with chili and, yay, two large, ripe custard apples! – at Santos Organics. Brunswick Heads. We munch on the custard apples, carefully sucking all of the divine flesh off the large, shiny seeds, on the Brunswick Heads Beach. I love the view of the entire Bay from this little piece of paradise; by now, the rain has subsided just enough for the lighthouse to stand out on top of the dark hill in the far distance. It’s nice to stand here and look over there and think about the lovely walk we had; to know that that dark mass encompasses so much beauty, so many good vibes, such a pleasant path. A little black and white bird accompanies us as we walk from our picnic spot half-way down the beach and back to the bridge leading over to the village. So cute! Every time we stop to admire the view or look lovingly into each other’s eyes, it stops and waits for us, regarding us quizzically, wondering what silly activity is keeping us, and as soon as we resume walking, it hops along with a relieved skip in its step, shaking the drizzle off its feathers with a happy wave of its wings, zigzagging between us and staying within a radius of a few metres of us the entire time. When we reach the bridge, however, it nods goodbye and directs its gaze towards the ocean. It’s a beach bird! In Brunswick, we listen to the upbeat live music playing in the front yard of the hotel, admire the walls of the public toilet building, which are decorated with swarms of various marine species created in colourfully painted ceramics by local kids, and share a vegan burger, perfectly balancing amounts, textures and flavours of a crunchy, sweet walnut patty, crispy salad, raw onion slices, juicy tomato bits and creamy aioli – at the Fish Bar, sitting outside and marvelling at the fantastic glorious light that the sun is cascading across the palms, Cook pines, swing set, with a couple of shrieking kids swinging along, and river across the road from us, as if it really wishes to add some style to its first, rather late, appearance of the day. Swallowing the last bits of our freshly baked gluten free bun, we get up and drive to a nearby lake to check out some more sun rays reflecting themselves beautifully in rocking waves before heading 30 minutes up the highway to the airport, thanking Byron Bay, each other and ourselves for yet another wonderful and wonderfully energising weekend.